This is the most recent of a series of attacking eagles I've painted, the only collage. 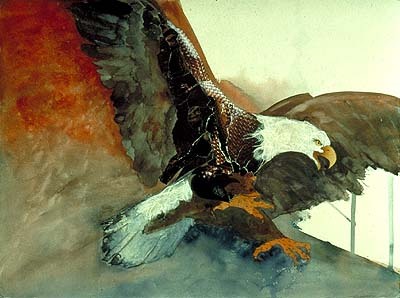 For me the eagle is a powerful symbol of strength and healing. I started the background in watercolor on illustration board. To superimpose the eagle on this background, I drew the bird, then painted the extended wings. I cut up a magazine advertisement of a woven leather shoe for the feathers of the inner wing and neck and added fibrous rice paper to the head and tail. The talons are also magazine cutouts. More details on p. 70 of Creative Collage Techniques. This collage also appears in Bridging Time & Space: Essays on the Art of Layering. on p. 68. Read these articles for more information on Working With Rice Paper & Tissue and Magazine Collage. To discuss the purchase of original art, please email me with your phone number or call 1-937-434-9977 and leave a message. I'll return your call as soon as possible.